Nicholas Hoult for the cover of VMAN31. Asked Bryan Singer, who directs Hoult in the new X-Men, to do the interview. Provided him with talking points regarding the theme of the issue, moderated the conversation, wrote the intro text under the pseudonym Franklin Richards. This entire piece is sort of an easter-egg metajoke for myself. 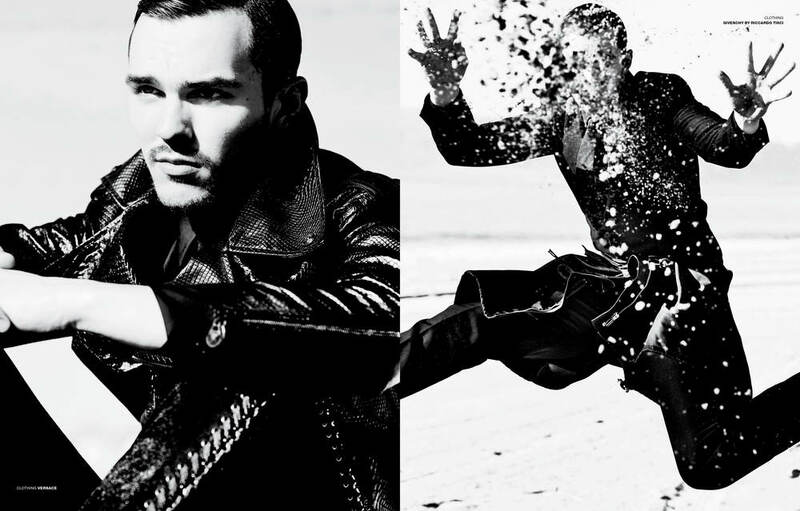 NICHOLAS HOULT REVISITS HIS ROLE AS BEAST IN THIS SPRING’S X-MEN: DAYS OF FUTURE PAST. HERE, HE TALKS WITH HIS DIRECTOR, BRYAN SINGER, ABOUT QUANTUM MECHANICS, TIME TRAVEL, RELIGION, ASTROPHYSICS, AND CELEBRITY. Many believe that truth lies in simplicity, that a thing is fully itself when reduced to its most basic. Particle physicists, string theorists, linguists, mathematicians, philosophers, even conceptual artists. Some demand empirical replicability—in order to confirm a discovery, the Large Hadron Collider needs 600 million collisions every second for two years. Some are more theoretical, epistemological, or aesthetic. Aldous Huxley’s Perennial Philosophy, Chomsky’s transformational grammar, Kant’s categorical imperative, Freud’s The Ego and the Id. But they all share the sentiment that ultimate truth exists in something like a singularity, and that through this truth, we can answer the bigger question of why? A smaller question is: how could you apply this logic to a person? How could you distill an individual to his or her elemental essence? One answer: very illegally. Hoult starred in his first major film at the age of 12, opposite Hugh Grant in the adaptation of Nick Hornby’s About A Boy, playing Marcus, the troubled son of a suicidal mother (Toni Collette). Grant’s character befriends the boy and attempts to draw him out of his introversion to engage in youth culture and develop an identity of his own. Hoult received rave reviews and awards for the Oscar-nominated film. The next time Hoult caught the attention of the masses was for the U.K. hit series Skins. The precocious kid audiences had known was completely gone. Skins debuted in 2007, the year Hoult would turn 18, and he became a full-blown heartthrob. But the real transformation that pertains to Skins was one within his character. The show, featuring an ensemble cast that also includes later-breakout Dev Patel, is largely centered around Hoult’s character, Tony Stonem, a sort of extreme take on the high-school popular guy archetype: a smug, polysexual, sociopathic narcissist who gets off on his own innate intellect and finds manipulation the ultimate form of entertainment. But, in the first season’s finale, his character entirely transforms after being hit by a bus and suffering a subdural hematoma. The second season, Hoult has to build his character from the ground up, a sort of Regarding Henry path of a sweet moron who must regain his faculties and then overcome the existential crisis of having lost his former identity while reconciling his past with his future selves. And Hoult pulls it off brilliantly, somehow maintaining the inexplicable core of his character throughout. The film role that followed Skins was not merely another transformation for Hoult, but for the filmmaker as well. A Single Manis fashion designer Tom Ford’s first foray into directing and screenwriting, and his adaptation of the Christopher Isherwood novel is a beautiful portrait of aesthetics and loneliness in 1960s Los Angeles. Hoult plays the handsome student attempting to transcend boundaries and become something more intimate to his depressed college professor, George, played by Colin Firth, who received an Oscar nomination for Best Actor. Hoult himself was subsequently nominated for a BAFTA. After A Single Man, Hoult went from Southern California in ’62 to the world of ancient Greek Mythology in Clash of the Titans, playing Eusebios, one of the finest soldiers in the Army of Argos, who accompanies Perseus on his quest and is ultimately turned to stone by Medusa. In last year’s underrated Warm Bodies, Hoult played a zombie mid-transformation, his body and behaviors like that of the undead, but his mind still clinging to human sentiments of love and anti-cannibalism. But it’s between those two roles that Hoult made his most literal transformation. In 2011’s X-Men reboot, X-Men: First Class, he took on the role of a young Hank McCoy, a mutant blessed with hyperintellegence. Through experiments stemming from his own insecurity about the physical aspects of his mutation, he accidentally magnifies them, becoming the beautiful, blue Beast. Hoult would spend hours upon hours in the makeup chair to transform into the furry, animalistic character, and it’s a role he reprises this Spring in X-Men: Days of Future Past. Director Bryan Singer describes the film—which follows Hugh Jackman’s Wolverine as he travels back in time via his own consciousness—as an “inbetwequel” of the previous X-Men films and of First Class, on which Singer was a producer and story writer. Meaning that Future Past fuses characters past and present, combining the last film’s stellar cast (Michael Fassbender, James McAvoy, and Jennifer Lawrence, with whom Hoult is romantically involved) with Patrik Stewart, Sir Ian McKellan, and Jackman. The two franchise casts form an X-Men super group, which is likely to continue with the next X-Men: Apocalypse, also helmed by Singer. (Fun fact: Beast is one of the few mutants to be a member of both the X-Men and The Avengers so who knows where that could lead). Here, the talented, transformative Hoult speaks with Singer about being, believing, and what the future holds. BRYAN SINGER To begin, I originally knew your work from Skins and A Single Man. Initially you were not available for the roll of Beast [in X-Men: First Class, which Singer produced]. You were going to do Mad Max and, fortunately for us, that got pushed and you were able to play the role. I only remember the decision that [director] Matthew Vaughn and I made to cast you, but I don’t know how that came to you on your end. NICHOLAS HOULT I was down in Australia starting prep on Mad Max and they told us it wasn’t going to shoot that year, so I called my agent and said I needed a job. The next day I read for X-Men: First Class. Strangely, the direction I got from Matthew for that was to try one version of the scene doing an impression of Stewie Griffin from Family Guy, which I was actually quite adept at doing because I’d wasted most of my youth away doing impressions of Stewie. That same night, I got a phone call saying “Jump on a plane, they want you to go back and screen test.” The next day Jen [Jennifer Lawrence] and I screen-tested together with Lauren Shuler Donner [producer] and Matthew Vaughn, and I remember being very annoyed because I had to get straight back on a plane to Australia and I didn’t think I had gotten the job. BRYAN Well, I knew you had the job because we had already made the decision. Can you give people a little background on how you got your start? One’s beginnings can translate later into how one deals with things. NICK The first thing I did, I was three years old. It was a play called The Caucasian Chalk Circle, but I really have no memory of that apart from doing a photo shoot for a day and being given juice and biscuits afterward. I got an agent when I was five, which is not something my parents planned. So I ended up doing a lot of British television shows between the ages of five and eleven. That’s when the Weitz brothers were casting About a Boy, and I went in for a few auditions for that and then they picked me. So that was my lucky break. How did you enjoy shooting this last X-Men? BRYAN This last X-Men was the most enjoyable experience I’ve had making a movie and I’m not just saying that because this is a conversation with one of our cast members. It was the fact that the cast seemed to actually be enjoying themselves. I don’t know if that’s a function of the environment, the story, or just the simple fact that no one person is carrying the whole movie. NICK I agree with you. I felt a lot more pressure when we were shooting Jack the Giant Slayer [also directed by Singer] than I had ever felt on another job, just because [as a film’s lead] you’re suddenly trying—in an odd way—to do more, but it’s not your job as an actor to try and do more. You’re there to make it real. But in an ensemble you feel quite safe, particularly with this cast where we could mess around and have fun. I’ve been meaning to ask about time displacement, which seems to be such a central element of this film. BRYAN Time displacement means, in terms of the film, Wolverine [Hugh Jackman] of the future travels back in time, into the mind of his younger self, and while he is traveling, he is the observer. I was on the phone yesterday for an hour with James Cameron discussing a lot of this same stuff. There are theories in quantum physics, such as Schrödinger’s Cat, which dictate that all observable matter behaves differently when observed—by the very act of being observed. So if, for instance, you were not seeing an event, there are questions as to whether the event occurred yet since it was not observed. It goes back to If a tree falls in the woods did it make a sound if no one was there to hear it? So there’s a theory that two things can happen simultaneously until the observer witnesses it. Wolverine’s future consciousness exists in the past, so until he wakes up in the future, the future doesn’t set itself, it remains the way it was. Because he is the observer, the moment he sees the new future, the future takes hold. When the future and the past coexist, that’s called the super-position. So when Wolverine wakes up, he ultimately collapses the super-position. That’s the quantum physics terminology for what’s happening in X-Men: Days of Future Past. NICK I think that makes sense. My smaller brain understands what’s going on there. There is kind of a liquid state with all the time-traveling until it’s certain which time he is going to be in fully. In the future, will time travel become possible, or is it physically impossible? BRYAN In our lifetime, no. In the distant, distant future, I think before time travel we’ll have time perception. I think at some point humans, as their brains advance and as they commingle with technology, will begin to start perceiving time differently. Perhaps the first stage will be suspended animation, you know, going to sleep for long periods of time and waking up 100 or 500 years from now. In order to discuss time travel, you really have to tap into the concept of multiverses and Einstein’s special and general theories of relativity, which articulate, among other things, that the closer you are to a gravitational force, the slower time moves relative to individuals existing far from a gravitational force. In other words, if you’re way out in space, away from our sun, time will move faster for you than if you were resting on Earth, near our sun. That’s people on Earth aging faster relative to someone travelling in space at great speed. But that’s not time travel, that’s time relativity. The harder thing to grasp is the idea of what gravity is. Everyone thinks gravity is like magnets, but no, gravity is an impression, it’s mass making an impression in space and time. NICK You’re very up on technology and science in general, so would you say that’s what you believe in more than any religion or philosophy? BRYAN I think so, generally speaking. But I leave myself open to things spiritual, because I believe there are so many things unknown. It is a miracle that we exist, that we have intelligence. It is such a miracle that we have Jupiter in our orbit to absorb all of the asteroids that could have destroyed the Earth, that we had just the right amount of carbon, just the right amount of heat, just the right amount of volcanoes and water. It’s a miracle that we have our consciousness and we can make art and music. NICK I remember in The Short History of Everything, the Bill Bryson book, he wrote down the chances of all the molecules lining up as they did and the number went on for pages. It wasn’t even a number that one could contemplate. So it is a miracle in that sense. BRYAN It’s great to have someone like Bryson explain things in layman’s terms so we can digest it. Christianity used to only be preached in Latin, so packs of people didn’t even know what was being said. Did you have a religious upbringing? NICK [I was raised] Christian, and I was even a choirboy for a couple years. I’ve never felt particularly religious though. I just try to be good. The sad thing is that a lot of the time, when you look at what’s wrong with the world, it’s people who believe their own religion so vehemently that they think everyone else’s god is wrong. It causes a lot of conflict, unfortunately. NICK I’m not saying anything against religion, it can be wonderful for many people and provide support when you need that spiritual element to pick you up in times of trouble. BRYAN Well, here’s the thing: in [next year’s] sequel, Apocalypse, one thing I want to deal with is the notion of religion and the notion of what would happen if a mutant was born 2,000 years ago? In ancient times, what would a person think of a mutant, what would the mutant think of themselves? Would that mutant be called a god? Would it think it’s a god? And would it be right to think so, in the context of that culture and that world? Those are some of the aspects I’m playing with in the sequel. When we get to lunch, I’ll gladly pitch to you, we’ll talk through it. But in an alternate universe where you aren’t an actor, what do you think you would want to do for a living? NICK It’s difficult to say, because I’ve been involved in acting since I was so young that I haven’t ever really thought about doing anything else. The great thing about acting is that when you are prepping for a film like Days of Future Past you learn so much about science and time travel and all these things, and if I’m going off to play an ancient warrior, I learn about that historical time and how to use their weapons and what it was like to live like them. I learn a lot through that process, so that’s why it’s such a great job for me. BRYAN What are you feeling when you’re portraying a specific role? How do you embody another person? NICK It’s tricky, because there’s no set approach to it with me. I’ve never really been taught a certain method or found one that I could stick with. It’s about being as prepared as possible, but also being flexible when you show up and someone says to do something different or says, “That’s not working, stand over there and do this and try that.” There can be times that you’re so involved in the character that you are completely in that zone and the cameras and everyone around you don’t exist and it’s just you and the other character you’re in the scene with. That’s a really great feeling. Even if the audience watching can’t see a difference between that take and a take where you’re distracted or something went wrong, it feels different. But sometimes it’s purely logistics. BRYAN The best advice I’ve gotten is to get myself a hobby. I haven’t been able to find one that I have taken seriously yet, but do you have one? Like, I know, for instance, Michael Fassbinder [who plays the young Magneto] has a fascination with sports and with racing and it’s a true interest. Is there something that takes you completely away? NICK One thing I really like is to get on a motorbike. It’s something that you have to be very focused on and it clears your mind. It feels very free. When you’re on the bike, no one is around telling you what to do, and that’s something about an actor’s life that you have a lot of, you know, you have to be at this place at this time and so on. So there’s kind of a freedom that goes along with being on a bike. I used to play a lot of racquetball, but now just whatever sport is around. I like to stay active and the rest of the time, pretty much, is just heavy, heavy drinking. NICK Yes, during our screen test. BRYAN Then you guys got together, then broke up, and now you’re together again. How has that been, working with someone that you’re seeing romantically? NICK It’s fun because in this business you are away from one another for long periods of time, so when you’re on set together it’s a brilliant thing, because you actually get to spend time together. Especially with this film, I got to spend time with her, but also the rest of the cast who I’ve worked with, on the previous film, so it was kind of like going back to school after the break and seeing all your old mates again. Which is a great thing. It doesn’t really affect the acting though. BRYAN Over a very short period of time she’s become quite famous with the Academy Awards and The Hunger Gamesand everything. Has that been interesting? Has she changed since attaining this particular level of fame? NICK The privacy thing obviously changes, but the rest pretty much stays the same. You can probably relate better, with you winning your first Oscar at 24 years of age. BRYAN No, it was with The Usual Suspects and I was 27 or 28, but I was a filmmaker, behind the scenes, and there isn’t the same attention projected onto you as when you’re a star. What I learned was that no one ever feels like they’re established. It humanized the industry for me, meeting with established actors and directors through that. NICK It’s like that thing whereby you don’t believe your own hype. Enjoy the good times, but don’t get swept away with it. And I think that’s something she’s capable of doing, and that’s what makes her special, but yeah, it is very odd, and I am just kind of a bystander in many ways. It is well-deserved for her. I haven’t really seen any change in her. BRYAN I asked James McAvoy something and I’ll ask you too. You know he can be very emotional, and in X-Men: Days of Future Past he has very emotional moments. So one night we were out at dinner and I asked him, “What do you think of when you’re crying?” The layman always assumes that you’re calling up some tragedy in your past or some very, very sad thought. But he said it was mostly, 99 percent of the time, that the character is sad and he allows himself to be sad for the character. When you do an emotional scene, are you calling upon something from your personal life or do you live it through that character? NICK It’s living through the character, but drawing from your own experience. The only time I can think back to doing that at the moment is, I remember shooting a scene in an episode of Skins, where my character was a jerk. He messed up and he was very lonely and upset with himself and it was kind of one of those things where in my head I had to think of a time when I felt similar, but at the same time I was thinking as the character in that world, in that position. So it’s kind of a mix of both. BRYAN I wish I had that talent to access the moment. When I try to say lines, it’s a total disaster. My first short film starred Ethan Hawke and I’ve never forgotten something he told me. He said, “Actors equal production value,” meaning you can blow up a bridge or a Death Star or a city, but nothing beats a close-up of the right actor in the right scene living that moment through. It’s just mesmerizing. That’s why we always look toward the most skilled actors to play these larger-than-life characters. What do you think of these comic-book movies now? NICK I think the reason people relate to them is that they tell the story of the outsider. With X-Men, Xavier and Charles have both approached the same problem and it’s interesting to see how each of them deals with it. The genre deals with morality and how to go from being an outsider to becoming part of something, and that is something everyone can relate to. Obviously they’re also popular because they’re entertaining and there’s a hero. The other day I was watching a video on YouTube of a dad putting on a batman mask and becoming his alter-ego, Batdad, around the house. And it was hilarious. People love a way to express themselves, and it’s a way for anyone to become a hero, even if they don’t have superpowers. BRYAN With comic-book films, X-Men in particular, there is an identification with the desire to embrace your normal self but at the same time celebrate your special self. It’s a mixture of who you are to some people, who you are to yourself, and then who you aspire to be. Your job also has three facets to it. You’re Nicholas Hoult the person, Nicholas Hoult the actor, and now Nicholas Hoult the celebrity. How much do you worry about the way people perceive the character you’re playing versus the way people perceive celebrity Nick Hoult? NICK Well, to be clear, the most important is the personal life and then the acting. The celebrity life sort of takes care of itself, I don’t really worry about it. I suppose it would be stupid to say it’s irrelevant, because that’s sort of part of what being an actor is, but there’s also that part of me that doesn’t want anyone to know anything about my personal life, because then they won’t be thinking about the characters, they’ll be thinking, Oh, that’s him, I know this or that about his life. It’s the same with everybody I guess, you don’t want to take your job home. You want to do your best job and be proud of your work, but you want a life outside of it. The film side of things can tend to be pretty all-consuming, particularly when you’re working for 12 hours a day with the same people, hanging out with them for months on end nonstop. It goes back to what I said earlier. You need your own life experiences to base the character on when you’re acting, so you do need time away from film sets and the film world. I do anyway.